Possums Self Contained Apartments is perfectly nestled in a secluded bush setting in Lindisfarne with spectacular views of Tasman Bridge, Derwent River and The Hobart City Skyline. With 3 accommodation apartments to choose from, the Spa Suite, Bay View Suite and the Honeymoon suite, these self contained apartmnets are perfect for couples who like a private and secluded location in a bush setting, but only 15 minutes from the Hobart City Centre. The Possums Bed and Breakfast is close to everything that Hobart has to offer and features numerous guests facilities including free car parking, tour desk and garden. 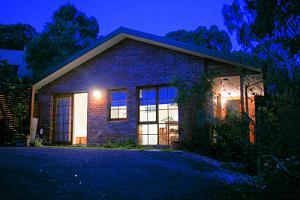 Possums Self Contained Apartments is nestled in a secluded bush setting in Lindisfarne with spectacular views of Tasman Bridge, Derwent River and The Hobart City Skyline. With 3 Apartments to choose from, the Spa Suite, Bay View Suite and Honeymoon suite, these self contained apartmnets are perfect for couples who like a private and secluded location in a bush setting, but only 15 minutes from the Hobart City Centre. . Nearby Attractions : 10 Minutes from Possums, Eastland's Shopping Centre, The Botanical Gardens and Government House, Derwent Ferries depart from Bellerive Wharf travelling to the city and casino, Salamanca Market (Saturdays only) is Australia largest outdoor market, Variety of fine dining in North Hobart and Salamanca includes Italian, Greek Canonise, Spanish, Mexican, Chinese, Thai Vietnamese, Middle Eastern and Indian, Coal Valley wineries stretch from Cambridge through to historic Richmond, Cascade Brewery and Tours(Australia's Oldest), The Female Factory historic site, Bonoring Park with Tasmanian Devils, Wombats, Koalas, Echidnas & Quolls, Cadbury Chocolate Factory or catch the double Decker bus and return by ferry cruising the Derwent River with a hot lunch provided. Bay View Suite : Sleeps up to 2 guests on 1 King Bed. Honeymoon Suite : Sleeps up to 2 guests on 1 King Bed. Potters Studio : Sleeps up to 2 guests on 1 King Bed. Spa Suite : Sleeps up to 2 guests on 1 King Bed.